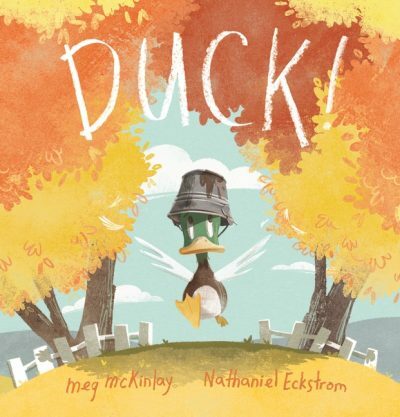 Duck!, from award-winning writer Meg McKinlay, is perhaps the most delightful picture book to feature a drawn-out play on a single word. The clues, laid out expertly in Nathaniel Eckstrom’s illustrations, are bound to be overlooked in the first reading. When Duck disturbs the other farm animals’ quiet afternoon by shouting its own name over and over, each successive animal is quick to correct Duck by pointing out the differences between them: ‘Don’t be ridiculous! You are a duck and he is a horse and I am a cow … you have funny webbed feet and I have these fine cloven hooves.’ These corrections are wonderful to read aloud and will make for boisterous story times, aided by the rich personalities Eckstrom gives to each of the animals. McKinlay ratchets up the suspense with repetition and, as the story builds towards the final punchline and the true reason for Duck’s exclamations, readers of all ages will be itching to see if their predictions come true. Recommended for children aged two to six, Duck! is a perfect farmyard addition to a long line of ‘joke books’ such as Jon Klassen’s ‘Hat’ trilogy and Aaron Blabey’s ‘Pig the Pug’ series.